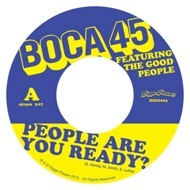 One of the most popular tracks from the recent critically acclaimed "Dig Eat Beats Repeat" album from Bristol's Boca 45 gets a timely 7" pressing. Featuring NYC's The Good People (aka Emskee & The Saint), Boca's old school boom bap provides the perfect backdrop for their energetic tag teaming - combining to create a perfect block party anthem. On the flip, hip hop renaissance men Soundsci flip the beat to a reggae tinged neck-snapper that should find a place in record boxes across the board!